Fleet Feet, Orange Shoe Personal Fitness and Brooks Running are teaming up once again for our annual Force of Orange training program. Madison’s premier group running program! All levels of running experience are welcome! 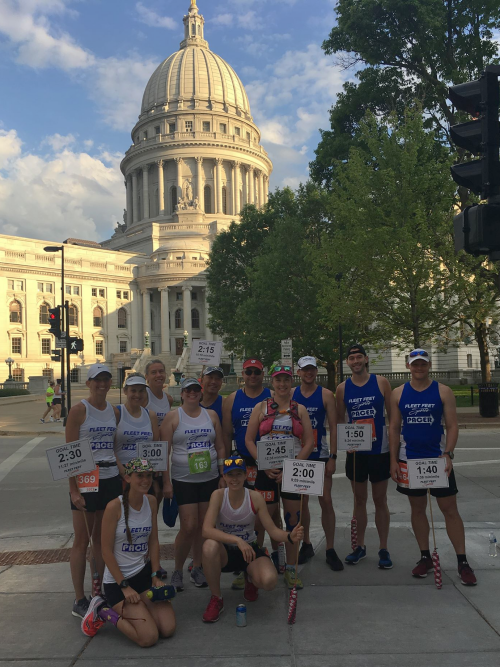 This program is tailored to helping participants train for the Run Madtown Half, Conquer the Capital 19.3 Challenge, and Green Bay Full Marathon. However, you are welcome to join us if you are preparing for another spring running event! PROGRAM DURATION: March 2, 2019 – May 26, 2019 (12 weeks). You can also use this program to train for the Lake Monona 20K and Syttende Mai! 20-mile race. In addition, several participants use this program to help them build for Grandma’s Marathon or other early summer races. Looking for something to really test your running limits? Sign up for the Conquer the Capital 19.3 Challenge and run the Twilight 10K AND Run Madtown Half. To learn more about Conquer the Capital Challenge, click here. Races built into the FOO 2019 Training Plans – in addition to the goal races. Weekend meeting locations will rotate between west, central, and east areas of Madison. Wednesday group runs will be centrally located in Madison except for days we have a seminar and/or event.. These recommendations are in place to help you stay healthy and injury free throughout the season and build on an existing fitness foundation. If you have any questions or concerns about these recommendations, please contact Megan: Director of Training Programs at sweetm@fleetfeetmadison.com. All participants registered for FOO by February 1, 2019 will receive pre-program build-up schedules to work on individually to help prepare for the first group run on March 3, 2019. Due to the duration of the training program (12 weeks in total), those interested in the full training are STRONGLY ENCOURAGED to register by February 1, 2019 in order to receive the pre-program schedule to build safely and properly for the first FOO group run. For those registering after February 1, 2019, you will receive the pre-program build up schedules shortly after registration. $5 of every training program registration will be donated to Gilda’s Club Madison. You have the option to donate additional funds when you register. We will have a few Gilda’s Club fundraising “workouts” throughout the program. To learn more about Gilda’s Club, click here. We are currently recruiting pacers for our Force of Orange Training Program! We are looking for pace leaders for the Sunday long runs throughout the length of the 12 Week Program. Pacers are assigned to run a designated pace +/-:05 minute mile for the duration of the long runs on Sunday mornings at 7:00am for the half and full marathon runners. We request that our pacers’ schedule allows them to pace at least 3 long runs throughout the course of the program. If you have experience running various half marathons and/or marathons, enjoy motivating other runners, and can run with enthusiasm, dedication, and commitment please contact Megan at sweetm@fleetfeetmadison.com. Pacers are required to attend a 1-hour mandatory pacer training session (date TBD) before the training program begins. 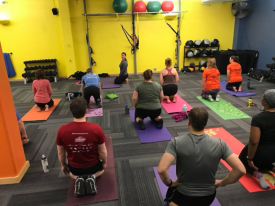 Description: Half Marathon and Full Marathon Training Programs: Fleet Feet and Orange Shoe Personal Fitness are teaming up once again for our annual Force of Orange training program. Madison?s premier group running program! All levels of running experience are welcome! This program is tailored to helping participants train for the Run Madtown Half, Conquer the Capital 19.3 Challenge, and Green Bay Full Marathon. However, you are welcome to join us if you are preparing for another spring running event!